It's Pasdariffic! - My journal. Yes. So after seeing that picture of Adrian Pasdar that aeloraposted...YOU KNOW THE ONE I'M TALKING ABOUT...my mind immediately went to the TWoP Motivator place. 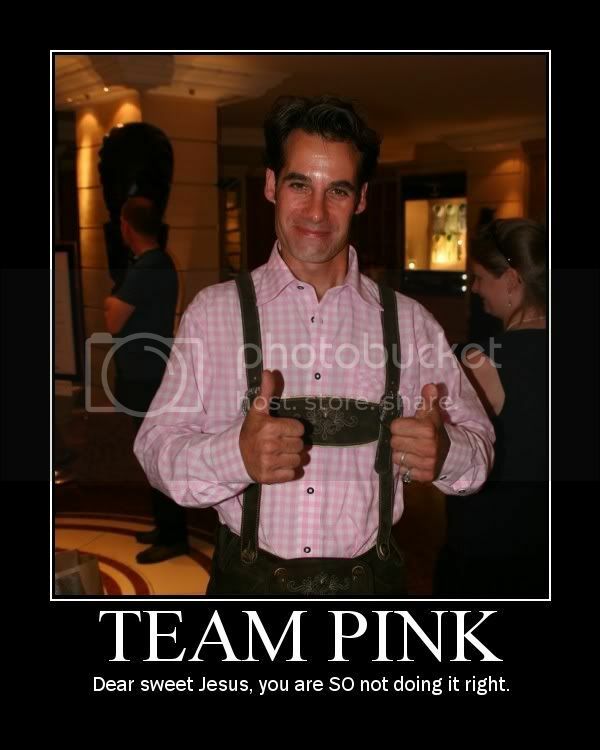 I mean, they've been doing a lot of ones of men in pink shirts lately. I couldn't help it. After seeing that, I'm suddenly willing to open up a bit to Zachary's Striped Tank Top of WTF?. I want to print that out on photo paper and carry it with me everywhere and when/if I ever meet Adrian, I am totally having him sign it!! If I didn't know he was married, I'd swear he was gay. There goes a man very comfortable with his sexuality. Oh, Adrian. I've been growing fond of him ever since the Comic Con pics- I think this cements it. Adrian is just made of lolz. I love this man, seriously. Oh my. Nothing anyone could have said could have prepared me for that. Perhaps he lost a bet? That really is the only semi-logical explanation I can come up with,and even that's a stretch. Wait. I thought I logged in! Curse my fresh-outta-bed (lack of) posting skills! Hee! It was probably the horror of seeing that shirt. Man, that tank top is really getting a bad rep. ::shakes head:: But, the real question is this: what's worse, the Laura Ingalls Tablecloth Shirt or... the "Tie of Temerity"?! Now, see, I kind of like the tie, and if he'd put it on with a nice solid shirt, I'd adore it. But that tank top... *shudder* I...just ripped on it in the motivator thread, again. AukTastic made me. Now see, I thought you hated that tie. I will admit, with so much crazy clothing going around, it is getting quite hard to remember who hates what. Also, I love how Team Sylar has once again infiltrated the Motivator thread... even if it is with a Calvacade of Cringe-worthy Clothing. As soon I get done with this pesky work, I may have to join in the fun. Seriously...is that not an awful shirt??? I think it's more horrid in the video than in a still photo. But I could not concentrate on anything else in it, because I just wanted to rip that damn shirt off him. And not in a good way! It is without a doubt, one of the most awful shirts I've ever seen in my life. It looks vaguely like a work-out shirt, like one you'd wear to the gym, but even at the gym he shouldn't wear it. I can just imagine getting the chance to meet him and get his autograph and squeeing so hard and then noticing what he was wearing...and then trying not to say anything terrible about it, since he's being nice enough to give me an autograph. It looks vaguely like a work-out shirt, like one you'd wear to the gym, but even at the gym he shouldn't wear it. EXACTLY! I think my first comment was "I wouldn't even wear that to work in my yard". The one thing that makes this pic bearable is the cheesy thumbs-up. And I don't really mind the lederhosen--it's that shirt! It reminds of the Gingham Girls paper dolls I had growing up. The color's not bad, but...my Lord. I still think he must have lost a bet!! !